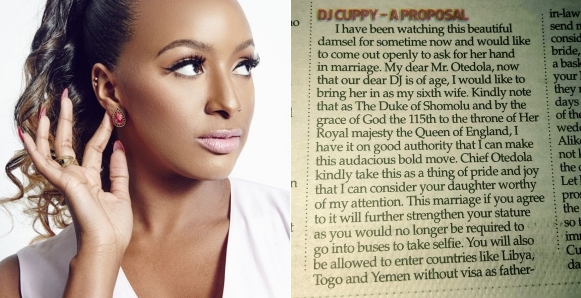 Nigerian entertainer, DJ Cuppy seems to be in hot demand lately as so many Nigerian men are bringing their A-Game; with the latest being getting proposed to in a newspaper. 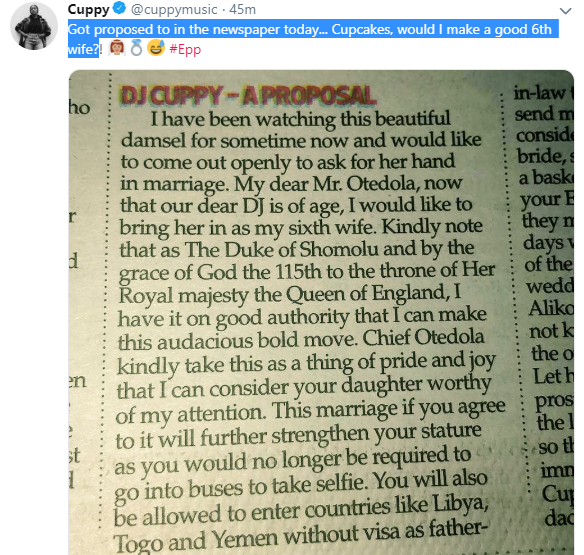 This is coming few days after we reported that One person seems to have benefited and very happy over DJ Cuppy and Asa Asika’s alleged break up rumours, and it is US based Nigerian singer, Speed Darlington. Speed Darlington who has been shooting his shoots to become DJ Cuppy’s man, couldn’t hide his excitement after speculation of a possible break up became a major topic across social media platforms as Asa Asika shunned DJ Cuppy’s birthday. “Is this true? Papa God I love you. Jehovah make it reality it’s my turn”. Cuppy was known to be dating a former Super Eagles player, Victor Anichebe before the duo parted ways last year, 2017. This prompted her to return to her ex-lover Asa Asika – Davido’s music manager who is a father of one. Both parties had littered the social media space with romantic contents in recent times but the party may have quietly ended. Posted by Mr. Cis on November 18, 2018.